First, two new book reviews. I had a chance to read the advance uncorrected proof of Tobias Buckell’s Sly Mongoose. Books like this are why being a reviewer makes me so happy. I might not make much money, and I might be fighting a losing battle against my review stack, but who could resist the delight of getting to read their favorite authors’ books whole months early?! I also read Tess Mallory’s Highland Rogue. I still don’t understand why the Scottish Highlands time-travel romance sub-sub-genre is so surprisingly populous, but at least I can now appreciate it properly—this was better than the other two I read! Tomorrow’s review should be of a slow cooker cookbook. 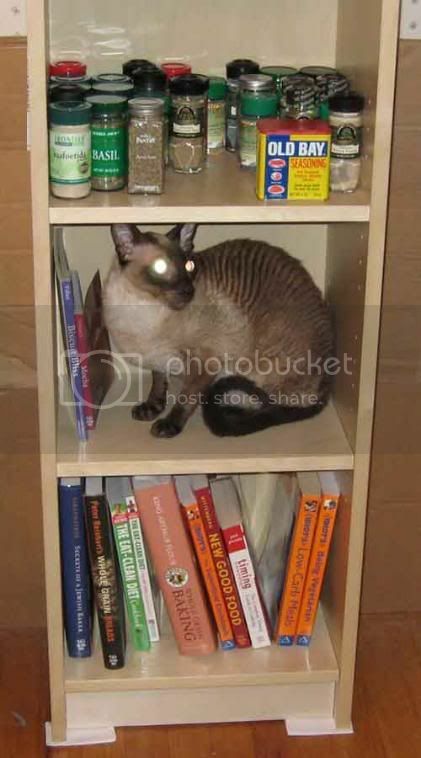 Yes, that’s Cahlash, trying his best to be a bookend. Or maybe he figures I’ll not notice he’s there, and put something yummy on the shelf. Yeah, right! I’m a little behind in catching up with comments and blogs, but hopefully soon! Looks like Cahlash is loving the new bookshelf! The pictures of Cahlash cracked me up! I so recognize the scene! Since we put up a bookcase in the bedroom, our cats have taken turns filling up the empty spaces as well! Nirvana (the older of the two) sits up on the second or third shelf from the bottom from time to time just to escape Archy’s playing and occasional fighting (Archy is just nine months old and from time to time he feels the need to assert himself). Archy climbs the shelves out of plain curiosity. I guess cats are the same all over the world! 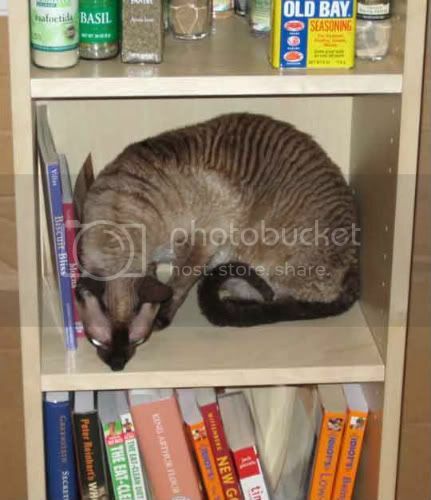 We did exactly the same thing (bookshelf with spices, etc.) in our kitchen. All hail IKEA! Myrthe: Hehe! Love it! They really are. ScottM: It’s so useful! We have more kitchen stuff than our kitchen has space, so we need all the help we can get. We have two shelves of spices on that thing (and I even culled some of our oldest ones), one of the cookbooks we’re currently using the most, and a couple I have yet to fill up. All hail IKEA indeed! awww…look at that cute cat! 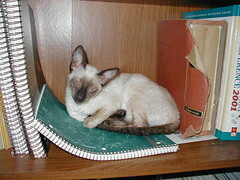 siamese are so adorable and beautiful!